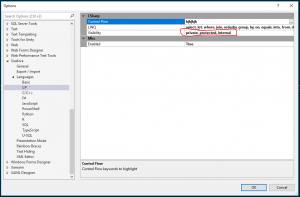 This post describes how I have configured Visual Studio (2017 is the current version) to look and behave the way I want it to. Writing it down makes it easier for me to repeat the setup the next time I install Visual Studio on a new computer, but maybe someone else will find it useful as well. 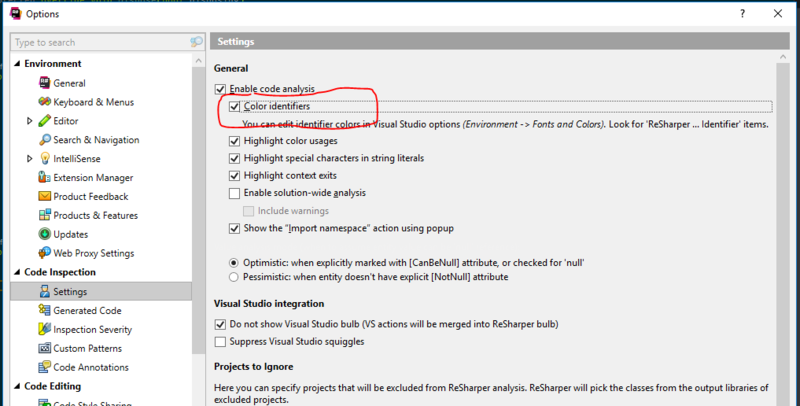 I have exported my Fonts and Colors setting in Visual Studio to make them easy to reinstall, and this also includes the customized ReSharper colors (see below). 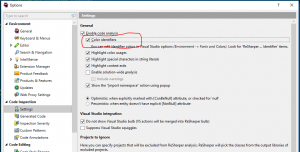 Download here and use the Tools/Import and Export Settings… option in Visual Studio. 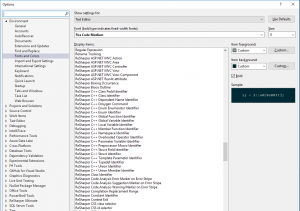 Install it into Windows by downloading the contents of the distr/ttf folder and install the different variants of the font by right-clicking on them in the File Explorer and select Install in the context menu. 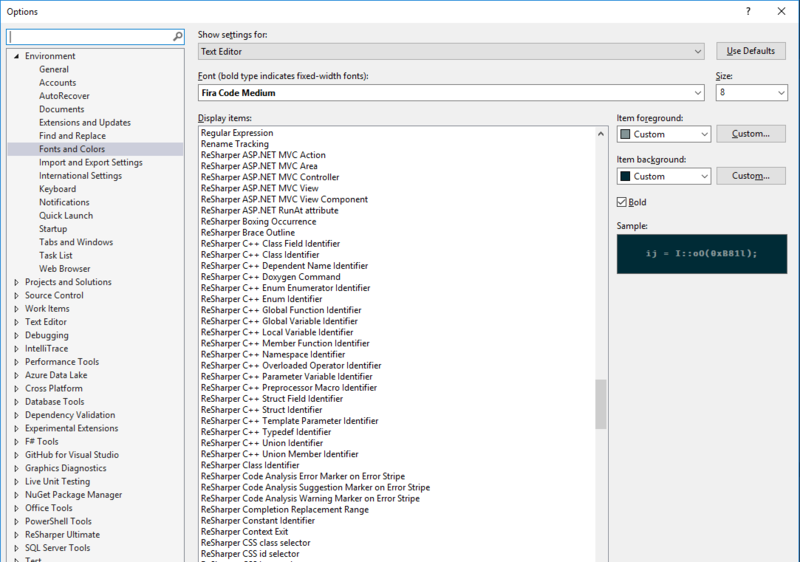 Then go to Visual Studio’s Tools/Options menu option, to Environment/Fonts and Colors and select the font you want. I use the Fira Code Medium variant as it looked the best on my monitor. 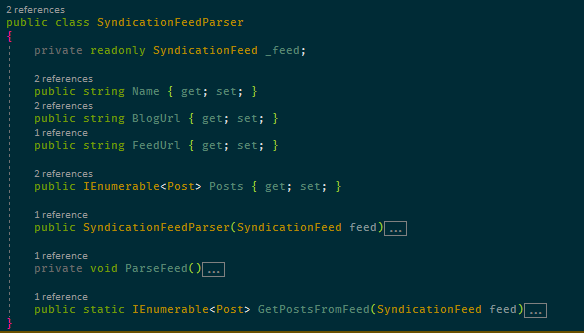 Setting the color theme and the font is still not enough to get the Visual Studio look the way I want. To go the whole way I also need two Visual Studio extensions: ReSharper and Viasfora. Compared to the example at the beginning of this post there are differences in that constants and methods are not colored, which I think they should be. 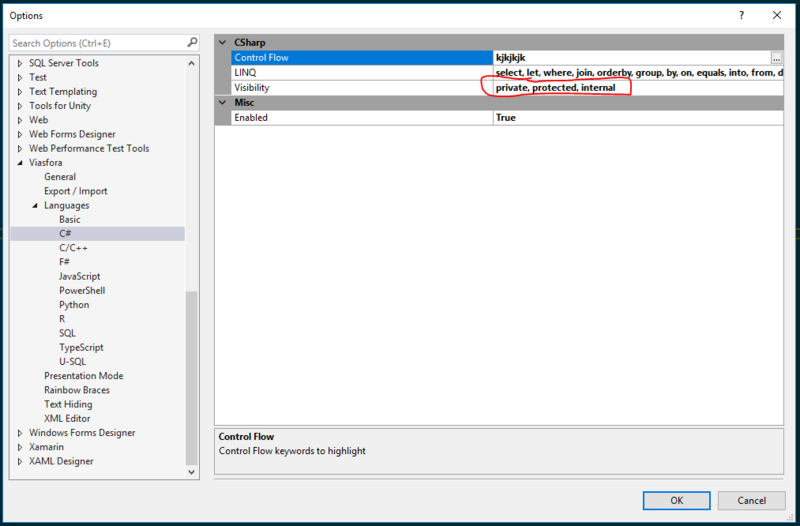 Since you’re already in ReSharper settings, you might also find it useful to enable the Use CamelHumps setting in Environment/Editor/Editor behavior. This is a feature which changes the definition of word delimiters when editing so that when moving the cursor to the next or previous word (Ctrl + Right/Left Arrow), it stops at upper case characters in camel cased symbols. Very useful for moving into long symbol names if you need to change something in the middle of them. I didn’t know I needed it before I saw it, but now I find it very useful to have parenthesis and bracket pairs to have matching colors which are different from the colors of nested parentheses. Makes it much easier to see parenthesis mistakes when writing code. Visasfora has this feature and the colors it uses are customizable too. Good luck with fiddling with configuration on your own, and feel free to post suggestions in the comments. Improving the development experience is a task I never expect to finish so new ideas are always welcome! I recently bought a new computer and as usual there was quite a bit of unwanted software on it, such as McAfeee LiveSafe anti-virus software. Getting rid of it proved near impossible, using normal Windows uninstall procedures resulted in strange error messages and there were services, registry entries and McAfee folders in many places so manual deletion was not really an option either.